So I lied to you. I was going to write about a wonderful wine tour through the rolling hills of Tuscany (that’s coming at another time), but I just wanted to tell you about my second home Bolzano so much that I just had to write it! Most people have never heard of Bolzano–it’s not exactly on everyone’s must-see list when visiting Italy. I’ve spent every summer of my life in this city so I must say that I’m quite biased, but this city and area of Italy is so unique and different from the other areas of Italy that it really is worth a visit, in my opinion. Located in the Northeast of Italy in the Trentino-Alto Adige region, Bolzano is interesting because the city is bilingual–German and Italian! The Germanic influence is felt everywhere from the architecture to the cuisine and the bilingual residents. Being a Florida girl and always having the ocean around I appreciate places with mountains and this area of Italy has some of the most beautiful mountains in the world–the Alps and the Dolomites. Outdoor activities abound, whether it’s skiing in the winter in chic ski towns or hiking and rock climbing in the summer months. Trentino-Alto Adige is one of the richest regions in Italy so the public services are top-notch and the cities are well maintained. It’s also a nice respite from the tourist laden regions of Lazio (Rome) and Veneto (Venice) so you can relax, reconnect with nature, and enjoy the slow-paced life of the Italian countryside. This region used to be part of Austria so the food very much reflects that. We stayed in Bolzano for 5 days and did quite a bit of hiking. When you get up into the mountains, much of the food is hearty, South Tyrol food such as canederli, polenta, weinerschnitzel, risotto, and apple streudel. After a long hike this food is just what you need! A great place that is in a small mountain town just above Bolzano called San Genesio is a restaurant and hotel called Tschoegglbergerhof (say that three times fast after a couple of glasses of wine). It’s a small bed and breakfast perched above the valley that contains Bolzano, only about a 15 minute drive from downtown Bolzano. I’ve stayed there before and the rooms are so quaint and cute and the food is always really, really good. 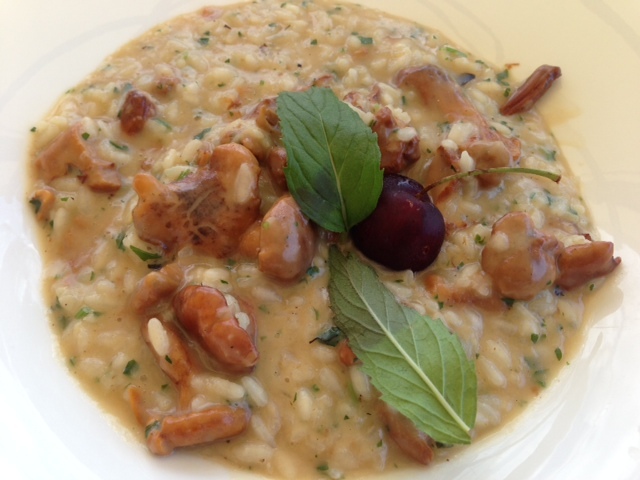 This time we had risotto con finferli which is risotto with chanterelle mushrooms. Amazing! These mushrooms grow wild around this region so you know they are always fresh. 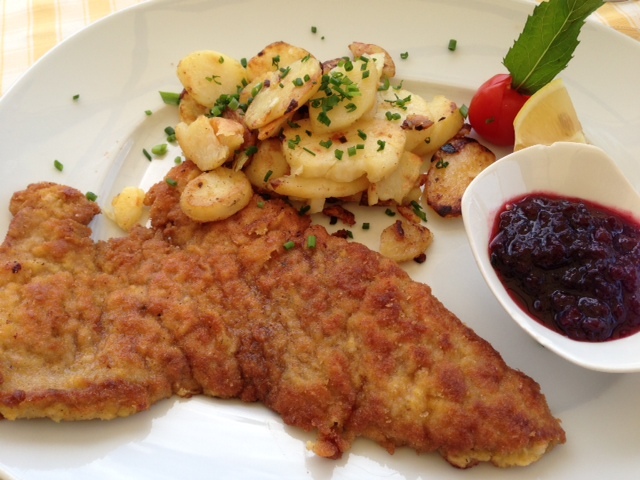 We also shared wienerschnitzel which is a common dish of breaded, fried veal cutlet. It came with roasted potatoes and a berry dipping sauce. We continued our hike (completely uphill!!!) for another couple hours and stopped at another spot where we decided to have our second lunch! We ordered another wienerschnitzel (why not), a couple beers, and dessert which consisted of vanilla gelato with warm raspberries and apple streudel. A couple of days later the family friend that we were staying with took us up in the mountains on a nice (also all uphill) hike to a restaurant named Baita Masare that is only accessible by walking or,in the winter, skiing. It’s right below a ski lift so in the winter it serves as an apres-ski, but in the summer you get the most glorious views of the Dolomites. Here we had a feast of shredded cabbage with speck (this is the region where speck comes from so you find it in several dishes), tagliatelle with venison ragu, canederli (bread dumplings filled with speck, cheese, or spinach in melted butter), and a few other goodies. Canederli are a specialty for this restaurant and they were probably the best I’ve ever had. This is “mountain food” at its best! Another great aspect of Bolzano is their famous Piazza delle Erbe which is an outdoor market in the center of the city that has stand after stand of fresh vegetables, fruit, nuts, meats, and cheeses. It happens every day, all day, except Sunday. Alto Adige is also a huge wine-producing region most known for their whites, such as Gewurtzraminer and Pinot Grigio. There are hundreds of wineries and many of them are located on the Strada del vino which is a signed route that tourists can follow to visit the wineries. We went and did some tastings at a few, the most notable called Tramin. If you’re looking for beautiful mountains and some fresh air go check out Bolzano next time you’re in Italy. There is so much to do and you’ll be taking a trek off the beaten path!